The ZenBook Series sets the standard for thin, light and elegant laptops, and ZenBook Flip 14 is no exception. Its all-aluminum design is just 13.9mm thin and 1.4kg light, and it has an ultracompact footprint that gives you a 14-inch screen in less space than many 13-inch models. The lid features our iconic Zen-inspired spun-metal finish that adds a unique touch of luxury, and you can choose from two sophisticated colors: Icicle Gold and Slate Grey. ZenBook Flip 14 is built to give you the raw power you need for effortless on-the-go performance. With the latest 8th Generation Intel® Core™ i7 quad-core processor, high-performance NVIDIA GeForce MX150 discrete graphics, 16GB RAM and an ultrafast 512GB PCIe® SSD, ZenBook Flip 14 will never keep you waiting. Whether you’re creating complex documents, mining data, retouching photos, editing videos, or simply taking a gaming break, ZenBook Flip 14 lets you do more, and do it quicker. ZenBook Flip 14 is the world’s thinnest 2-in-1 laptop with discrete graphics, giving unprecedented graphics performance in an ultra-compact device. With discrete graphics, you can enjoy ultra-smooth video playback, superb multimedia creation capabilities and impressive gaming performance. Retouching photos, editing videos or creating any kind of graphical content is much quicker — whether in laptop mode or tablet mode — than with standard integrated graphics, so your creativity can really shine. 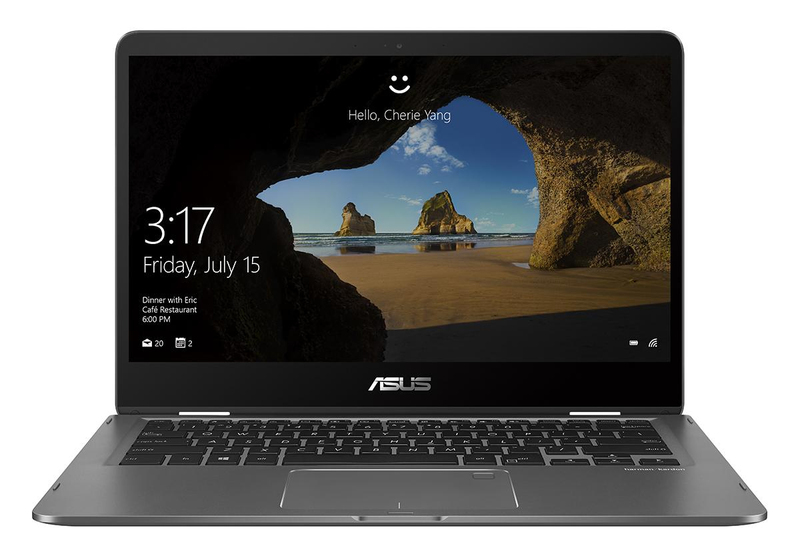 And the high-performance graphics also ensure a natural, highly responsive experience when you're using the ASUS Pen with ZenBook Flip 14. Accessing your ZenBook Flip 14 couldn’t be easier or more secure, thanks to Windows Hello technology and the fingerprint sensor built into the touchpad. Now there’s no need to type in your password every time to log in — a single touch is all it takes!